Plan a Great Party with The Clubhouse Scene ~ Austin, Texas - R We There Yet Mom? As a parent, we want to plan the best birthday parties for our children. With the advent of Pinterest, the competition has been amped to have the cutest invitation, the best cake, the most fun games, and of course, out-of-this-world decorations. And with all that work, YOU never get the opportunity to enjoy the party! Rebecca, owner of The Clubhouse Scene, found it difficult to piece together parties every year for her daughter. While she enjoyed creating the best parties, and she is good at it y’all, she was frustrated with having to entertain the whole time and NOT getting to enjoy her daughter’s parties. So Rebecca took her talents and what she did best to help other mom’s in the Austin area and opened The Clubhouse Scene. She now plans all inclusive children’s parties and event planning – she takes on all the work so you can enjoy the birthday! Last week, we were invited to participate in a “mock” birthday party that was put on by The Clubhouse Scene and held at Gorgeous Millie. The “Mad Hatter Tea Party” featured amazing decorations, sword-fighting games for the boys, fun make-up & costumes for the girls, and stories & pictures with Alice. We were also treated to amazing cupcakes and precious petit fours from The Dream Bakery – absolutely delicious! And my children really enjoyed running around Gorgeous Millie – a “pre-preschool” for 0-3 years olds. It is a nice, clean environment filled with fun toys and a huge reading area for you to play with your child. It’s a fantastic place to hold a birthday party for your young ones. The one thing that impressed me the most was Rebecca’s attention to detail. From the “Eat Me” petit fours to the “Drink Me” water bottles, the food table was impressive. 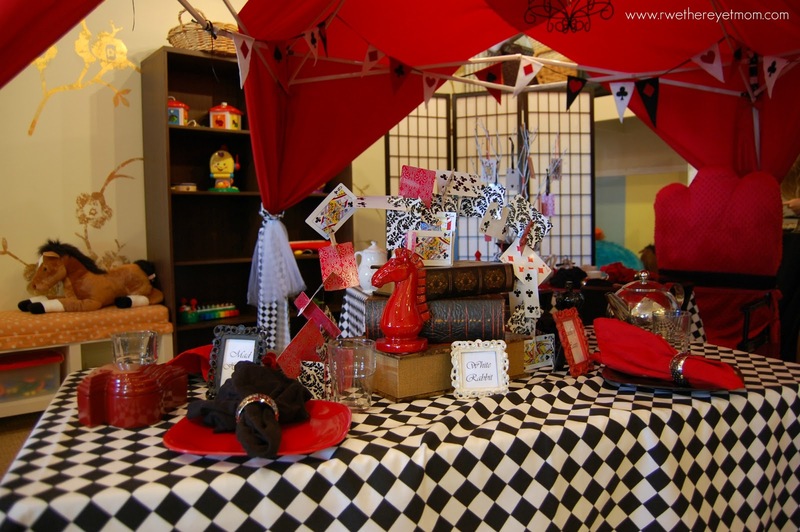 I also loved the table decor – the cards floating magically through the air was perfect. These decorations put most pinterest ideas to shame! As your children get older, the harder it becomes to throw a memorable party. Rebecca has fantastic ideas to create a cool, yet fun party for those who may think it’s too cool to even have one ~ Masquerade Ball with dancing anyone? My 11 year old daughter would love that! 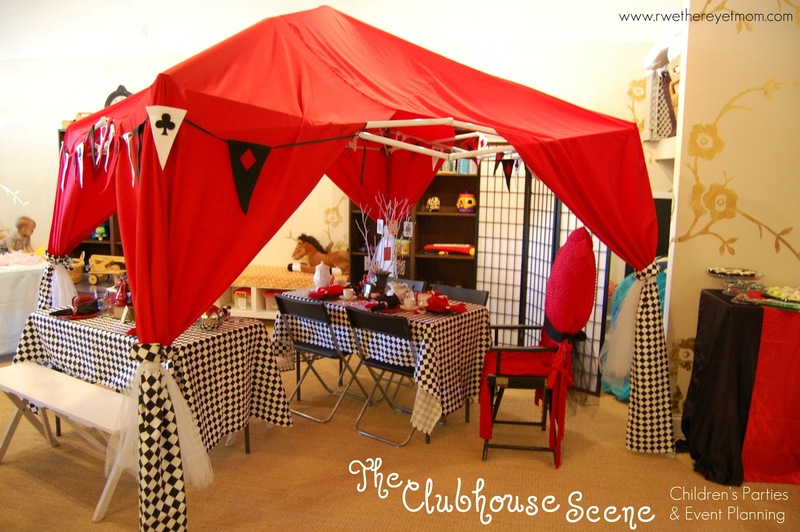 The Clubhouse Scene provides all inclusive packages for parties that includes personalized invitations, props & decorations, costumes, crafts, game, prizes, and more. But the best part of the package? TWO professional party hosts that execute the party with your children’s guests. And that means I get to sit back, visit with the adults, and enjoy my child’s party. Love it! I encourage anyone who has an upcoming birthday to plan to consider The Clubhouse Scene. Let them do all the work and let YOU & YOUR child enjoy the party – that’s the way to is supposed to be, isn’t it? My children and I were invited to participate in The Clubhouse Scene’s party. I was not financially compensated for this post. All opinions of The Clubhouse Scene, The Dream Bakery, & Gorgeous Millie are strictly my own based on my experience. 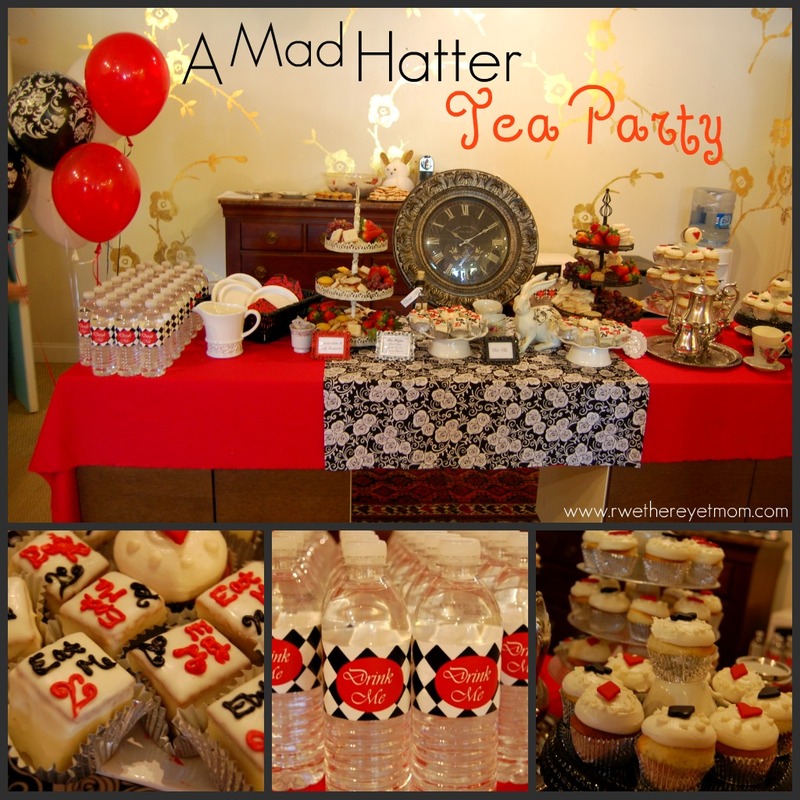 I want a Mad Hatter party! Obviously I haven’t used the Clubhouse Scene from up here in Canada, but we always get other people to handle our kids birthday parties. It’s so much more relaxing, and worth way more than it costs.